The thought of Walt Disney World conjures up many vibrant images, chief among them a certain famous castle, a contemporary resort, Epcot’s epic boardwalk and the glamour of the Polynesian. What visitors may not know is that families can camp at Disney World — it’s true! Located just on the other side of Bay Lake from the Contemporary and Cinderella’s castle are The Campsites at Fort Wilderness Resort. Opened in 1971 as one of the original Walt Disney World Resort Hotels, The Campsites at Fort Wilderness Resort span 750 acres of lush, wooden space that is both far removed from the hustle and bustle of the Magic Kingdom, but also so close that you can be at the main entrance in a matter of minutes by boat (or a little longer by bus). With a multitude of indoor and outdoor dining options; musical and stage entertainment; activities such as horseback riding, wintertime sleigh rides, fishing, biking, swimming, archery lessons and nightly movies under the stars; and several accommodation choices for backpackers, RV-ers, and families who have never pitched a tent before, The Campsites at Fort Wilderness Resort offer the best of what Disney has to offer: classic family fun for families in a one-of-a-kind setting. Thanks to a unique golf cart culture (bring your own or rent one onsite) at the Campsites, you and your family can also hop between Fort Wilderness Resort amenities and attractions in comfort and with ease. If you visit during Halloween or Christmas, feel free to bring decorations to adorn your RV or tent site AND your golf cart! A robust canopy of trees keeps the entire Fort Wilderness Resort shady and cool, and this is true of the hundreds of campsite locations, too. 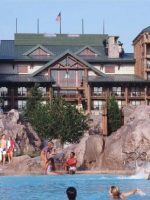 There are well air-conditioned comfort stations throughout the campsites at Fort Wilderness Resort, each with restrooms, private showers, laundry facilities and ice machines. When booking your space, ask about the different loops and locations available for your RV or tent site. If you plan on spending a lot of time in the Meadows Swimmin' Pool area (which is close to the canoe/kayaks and bike rentals) or if you think being closer to the bathrooms in the comfort stations and/or bus stops work best for you, be sure to mention exactly what you would prefer while booking to ensure you are located in the ideal spot for your stay at The Campsites at Fort Wilderness Resort. The most affordable accommodation option at Fort Wilderness allows you to bring your own tent or you can let the cast members at Fort Wilderness set one up for you! With some tent sites in and around the RV loops and some closer to the common areas, picnic tables and comfort stations, there's bound to be a tent site at The Campsites at Fort Wilderness that will suit your family's needs. 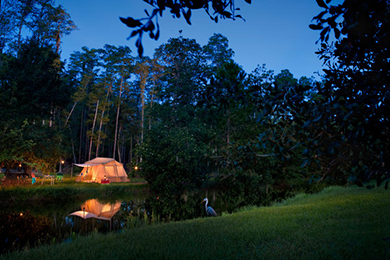 There are two options for RV camping at Fort Wilderness: Full Hook-Up and Premium. The latter will run, on average, $15 more per night, but will have you closer to the amenities onsite. 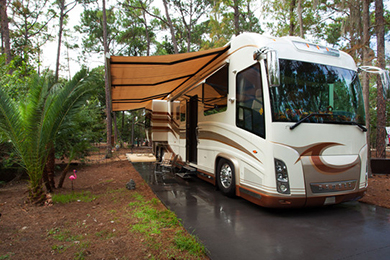 Both RV sites include a picnic table, grill and all necessary hook-ups to fully enjoy your camping at Fort Wilderness. Complimentary high-speed Internet access is available as well, with a modem kit obtained at the Meadows Trading Post. 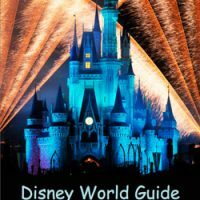 This is a great place to stay when visiting Disney! The Disney transportation to get around everywhere is outstanding and all the lines to get back to Fort Wilderness are much shorter than to the parking or other resorts. Even at Fort Wilderness they have the Special Disney Magic that Disney is so good about having. The Restrooms and Showers are clean (even when RVing we like to use the campground showers with a family of 7 it is much faster than everyone waiting for the shower in the bus) at all hours of the day and night. The pool was heated and had a great staff working the pool area. 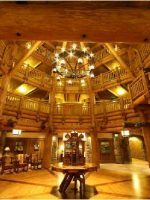 If you are planning a trip to Disney I would take a serious look at Fort Wilderness....the whole family loved the place. Excellent campsite and amenities. Great bike trails, quiet sites, and nice pool. Very easy acess to all the Disney attractions. This is our favorite campground so far as we travelthe US. 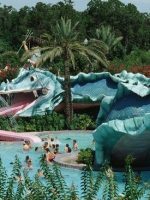 We plan to go back whenever we go to Florida. The Meadow Swimmin' Pool features a fast, 67-foot long corkscrew fort-themed slide and a serene whirlpool with a kiddie splash area nearby so resting adults can easily keep an eye on their little water bugs. Swim diapers are required for non-potty-trained children (available at resort Trading Posts) and pool hours are 7 a.m. to midnight. There's more than just water play at the swimmin' pool, as the area also features frequent staff-led activities and games for kids of all ages. Closer to the cabin sites, there's a more subdued Wilderness Swimmin' Pool, also open from 7 a.m. to midnight each day. There are two indoor arcade rooms at Fort Wilderness. The smaller of the two is named after Daniel Boone and is located near the Meadow pool. Inside are 15 retro and new games, and air hockey. That arcade is open from 7:30 a.m. to 10 p.m. daily. Behind Pioneer Hall is the larger, 2-story Davy Crockett's Wilderness Arcade with nearly 20 games. Hours are 7 a.m. to midnight. Just a stone's throw from the Meadow Swimmin' Pool is the resort boat and bike shop offering a fleet of bikes for rent, as well as canoes, kayaks and cane fishing poles (and bait) for use on the canals. Bike rentals are available hourly or by the day, and baby bike seats, bikes with training wheels and lockers are also available. Those not up for a bike ride or spending time on the water can choose to rent tennis and shuffleboard equipment for free with a Magic Band (or resort Key Card). The Bike Barn opens at 9 a.m. daily, with closing times varying by season. While not exactly how early explorers got around, guests ages 16 and up can sightsee on all-terrain Segway X2 vehicles. 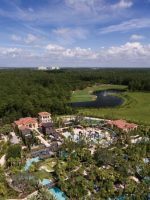 You'll traverse over paved paths and wooded trails alike on this two-hour tour that includes stops at Disney's Wilderness Lodge, the stables of Tri-Circle-D Ranch, and Bay Lake. Expect your guide to regale you with Disney trivia and anecdotes along the way. Tours depart from the Bike Barn at 8:30 and 11:30 a.m., Tuesday through Saturday. Call 407-939-8687 for reservations. Hitting the bull's-eye for fun at Disney has never been easier than this 90-minute archery program that gives adults and kids ages 7 and up the opportunity to learn how to hold a compound bow and fire away arrows at targets. Friends and family not participating can watch from a safe viewing area. The 90-minute archery lessons are $39 per person and are available at 2:45 and 4:15 p.m. on Fridays and Saturdays. For reservations, call 407-939-7529. The Campsites at Fort Wilderness Resort is the only Disney resort with regular daily appearances by costumed characters, as Chip 'N Dale arrive nightly to sing, dance and play with kids while roasting marshmallows before the free evening Disney movie begins. Pick up the S'mores ingredients you forgot to pack, as well as popcorn and other cinema essentials, from the Chuck Wagon snack bar located onsite. See Clydesdales, Arabians, Belgians and all the majestic equine of the Magic Kingdom, talk with a caretaker, watch a blacksmith make a horseshoe, see and hear the famous Dragon Calliope, and go on a fun pony, horseback (ages 9 and up), wagon, carriage or a holiday sleigh ride. Times and departing locations vary. Call 407-939-7529 for reservations. You'll be happy to know that all the Walt Disney World horses get plenty of rest and break time during their workday, and are well cared for at the Ranch. Conveniently situated in between Pioneer Hall and the marina, this large playground features one of the only standalone swing sets (including baby swings) at Walt Disney World Resorts. There's also a pair of climbing structures and multiple slides for kids ages 2 to 12. The Playground has plenty of open space, too, so kids can grab a colorful hula-hoop from out in front of The Trail's End Restaurant beside Pioneer Hall and have fun twirling it about. There are several other smaller playgrounds located throughout the Campsites at Fort Wilderness. Take a run, jog or walk along the 2.5-mile New Balance trail that runs through the Fort Wilderness Resort grounds. For a shorter workout, explore the 3/4-mile shaded fitness trail and bike path connecting Disney's Wilderness Lodge and The Campsites at Disney's Fort Wilderness Resort. 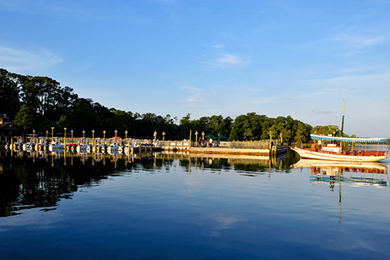 Overlooking Bay Lake, with the Magic Kingdom off in the distance, the marina is your family's spot to rent pontoon boats or climb aboard zippy two-person SeaRaycers, as well as embark on guided two-hour bass fishing tours, and head over to the Magic Kingdom for a day of Disney World park fun. Lounge chairs, hammocks, and sandy tetherball and volleyball courts await players as you await your boat ride. Return to the Clementine's Beach at the marina at 9:45 p.m. each evening to watch the Electrical Water Pageant, which is followed by the nightly Wishes fireworks show. Across the lake at Sammy Duvall's Watersports Centre at Disney's Contemporary Resort, you can sign up for waterskiing, wakeboarding or parasailing sessions. 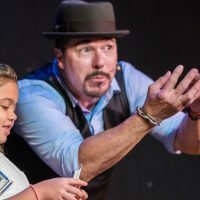 Do not miss this two-hour vaudeville style dinner show with skits, songs and comedy. Enjoy plenty of all-you-can-eat chicken, ribs, salad, beans and cornbread while having a great time inside Pioneer Hall. Unlimited beer, wine, sangria and soda are included. There are either two or three dinner shows nightly, depending on the season. 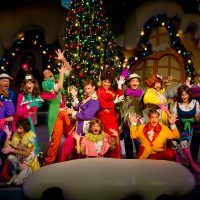 As this is one of the most popular shows at Disney World Resort Hotels, you will want to call 407-939-3463 to reserve your table well in advance (pre-payment is required). This covered, open-air pavilion behind Pioneer Hall features single nightly seating at 5:30 p.m. from Tuesday through Saturday for an all-you-can-eat BBQ picnic dinner, live country-western music and plenty of family-friendly entertainment, from line dancing to character visits. Menu options sure to please the entire family include ribs, chicken, hamburgers, hot dogs, mac and cheese, corn on the cob and more. Special dietary needs can be accommodated. Call 407-939-3463 in advance to make arrangements and reservations. Wine and beer are complimentary for those 21 and up. This casual restaurant in Pioneer Hall acts as an all-you-can-eat buffet at breakfast and dinner, and an a la carte lunch destination for families looking for sandwiches, salads and pizza. There's also a take-out window to grab a bucket of fried chicken or a pizza to go. This rustic lounge next to Pioneer Hall serves up wings, pizza and nachos. Grab a quick bite and drink to enjoy in a rocking chair on the front porch, where you can watch the horses, wagons and golf carts go by. Located behind the wooden stadium seating of the outdoor movie screen, this snack bar delivers all your S'mores fixings, as well as movie essentials: popcorn, hot dogs, and ice cream. This is the in-season spot for a light bite while enjoying pool time and before/after your biking, canoeing or Segway adventures departing from the nearby Bike Bar. The window serves sandwiches (grilled cheese, chicken Panini and more), salads, snacks and treats from 11 a.m. to 5 p.m. Affordable kids' meals come with grapes, carrots and milk or water. Overnight guests at The Campsites at Fort Wilderness enjoy exclusive perks like early-entry and late-stay theme park privileges (Extra Magic Hours), free onsite transportation, free parking, the ability to make FASTPASS+ reservations 60 days in advance and the opportunity to participate in a Disney Dining Plan with a Magic Your Way Package. Additional privileges include online room check-in, resort airline check-in and airport transportation service via Disney's Magical Express. With pet and golf cart parades, and cabin and golf cart decorating contests, recreation cast members and Fort Wilderness guests spare no expense or energy in flaunting their unique style over the Halloween, Christmas and New Year's Day holidays. For all of your souvenir needs, or to pick up those important items like charcoal and lighter fluid you accidentally left at home (or couldn't bring on the plane), there are two Trading Posts at Fort Wilderness. Check hours upon arrival. Electric golf carts make the Fort Wilderness Resort experience so much more fun for kids. Rent them from the reception outpost for $59 per day. With a limited supply of carts onsite, it is encouraged that you make your golf cart reservations by calling 407-824-2742 up to a year in advance. You can expect to see deer and fawn grazing about the Fort Wilderness property. Have your camera ready! And while at Fort Wilderness, ask about the huge bat house that sits along a nature trail! From Orlando International Airport (MCO), hop on Disney's Magical Express, the free round-trip airport transport available to all guests of The Campsites at Fort Wilderness (advance reservation is required; limited hours). Note: This bus ride can take upwards of an hour, as it will make several stops. While there is a fun Disney informational program running on TVs aboard the bus, your little kids may get antsy during this final leg of your journey to Fort Wilderness and the Magic Kingdom. If renting a car from Orlando International Airport and driving to The Campsites at Fort Wilderness, take Jeff Fuqua Blvd. to FL-417 Toll Road S. Then take Exit 6 for Intl Drive toward FL-536/ Florida 535/I-4 East, and follow signs to Walt Disney World/Fort Wilderness Resort. This drive should take about 30 minutes. Because cars, trucks and other motor vehicles are only permitted at your Fort Wilderness accommodation site, across from the Meadow Trading Post (with a 15- minute parking limit) and at the Outpost Depot, plan on doing a lot of walking, golf cart riding or bus stop waiting. Complimentary bus transportation is provided throughout the resort, but isn't the swiftest way to travel. You can bring your own bikes or rent them from the Bike Barn or rent an electric golf cart, which will eliminate those long, sweaty walks and bus stop waits. You must be at least 18 years old with a valid driver's license to rent a golf cart and 16 years old with a valid driver's license to operate one. 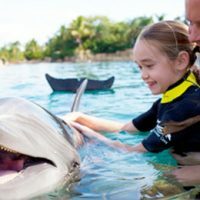 Reservations can be made by calling 407-824-2742 up to a year in advance, and are recommended for weekends, during the summer and on school holidays. From the marina, the Magic Kingdom is a free, short and very pleasant ferry boat journey away. The views are terrific and the breeze is wonderful. 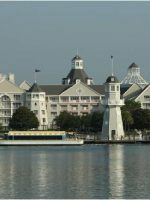 To get to Epcot and the resorts along the boardwalk, take the free ferry from the marina to the Magic Kingdom and transfer to the Transportation and Ticket Center. From there, board an Epcot-bound monorail. There's not a lot of opportunity for romance at The Campsites at Fort Wilderness Resort, but grabbing a few adult beverages from Crockett's Tavern and snagging a hammock on Clementine's Beach to snuggle up and watch the nightly fireworks show together isn't too shabby a way to put a bow on another happy day at Disney. Aside from that, how romantic do you find a two-person canoe?